The sculpted halls and echoing chambers of dwarven kingdoms are scattered throughout the Underdark like forgotten necklaces of semiprecious stones. Dwarven kingdoms such as Xonathanur, Oghrann, and Gharraghaur taught the less civilized races of Faerun what it meant to hold and wield power. Unlike the ancient human empires, the dwarves distrusted magic, so they were never seduced by the heights of magical folly that toppled Netheril and Imaskar. Instead, the dwarves become locked in eternal wars with goblin-kind and the other dwellers in the Underdark. One by one, the dwarven empires of the north failed, leaving only scattered survivors in the mountains or unconquered sections of the Underdark. The clans that survived these battles are the shield dwarves. For many human generations there were divided into two types: the Hidden, given to reclusion and secrecy, and the Wanderers, comfortable with other races and inclined to exploration. Since the Thunder Blessing, the older members of Hidden clans are beginning to change their hearts. Within a few decades the differences between Hidden and Wanderer may become meaningless. * Ability Adjustment: +2 Constitution, -2 Charisma. * Stonecunning: +2 bonus to Search checks when inside. * Lore Affinity: +2 bonus to Lore checks. * Weapon Familiarity: Dwarven waraxes are treated as martial rather than exotic weapons. * Hardiness vs. Poisons: +2 racial bonus to saving throws against poison. * Hardiness vs. Spells: +2 racial bonus to saving throws against spell and spell-like effects. * Battle Training vs. Orcs and Goblinoids: +1 racial bonus to attack rolls against orcs (including half-orcs) and goblinoids (including goblins, hobgoblins, and bugbears). * Favored Class: Fighter. A multiclass shield dwarf's fighter class does not count when determining whether he takes and experience point penalty for multiclassing. Dwarven culture extols the virtues of battle, and the vocation comes easily to dwarves. Regions: Damara, Dwarf (shield), Impiltur, the North, Silverymoon, Vassa, the Vast, and Western Heartlands. Found largely in the northern reaches of western and central Faerun, shield dwarves are the dominant northern branch of the Stout Folk. Renowned for their smithwork and craftmenship, shield dwarves had endured a centuries-long decline in the face of never-ending wars with orcs, goblins, giants, and trolls. Shield dwarves are descended from the founders of Shanatar, a legendary dwarven empire that once ruled the caverns beneath modern-day Amn, Tethyr, and Calimshan. After Shanatar fell, the shield dwarves migrated north, founding kingdoms such as Ammarindar, Delzoun, Gharraghaur, Haunghdamar, Oghrann, and Sarbreen. Although those kingdoms have also largely fallen, the Stout Folk of the North endure. The Thunder Blessing has served as a welcome reprieve for the beleaguered shield dwarves, giving hope that the descendants of ancient Shanatar may one day reclaim the glory of their forebears. Taller by half a foot than their gold dwarf cousins, shield dwarves average 4 Â½ feet tall and weigh as much as an adult human. The skin of a shield dwarf is fair or lightly tanned, and her eyes are usually green or silvered blue. Both genders wear their hair long, and males (and a very few females) have long, carefully groomed beards and mustaches. Hair color ranges from light brown to red, with all shades fading to silver or white as time progresses. Shield dwarves keep their word, whatever the cost, and are incredibly stubborn, unwilling to concede an inch unless there is absolutely no alternative. Such intransigence has enabled dwindling shield dwarf populations to hold on to ancient strongholds with just a fraction of their original defenders. However, it has also led to clan feuds and long- standing misunderstandings with other races that have sapped the strength of the Stout Folk. Shield dwarves love worked beauty, seeing the world as raw material to be forged and shaped into something more than the original. Shield dwarf, male: 4'2", +2d4, 145 lb., X(2d6) lb. Shield dwarf, female: 4'0", +2d4, 110 lb., X(2d4) lb. Shield dwarves trace their history back to Taark Shanat, third son of the great ruling clan of Bhaerynden. In the legendary times more than twelve thousand years ago, the Great Crusader and his eight sons led a great westward migration of dwarves from Bhaerynden in hopes of founding a new homeland. The Cloaker Wars pitted dwarves who followed Shanat against the mysterious inhabitants of Rringlor Noroth, who rose from the depths of a great chasm in a battle for control of the caverns of Alatorin. The Stout Folk eventually prevailed, after Taark slew four blue dragons who claimed the Rift of Dhalndar as their demesne. By the hand of one of the dwarven gods, probably Dumathoin, the skulls of the four wyrms cam together with a throne that emerged from the cavern floor to form the Wyrmskull Throne. Taark renamed the wyrms' lair Brightaxe Hall and founded of the kingdom of Alatorin. Shield dwarves mark the founding of Alatorin as the beginning of the First Great Age of Shanatar. One Alatorin was established, the eight sons of Taark Shanat set off to found their own kingdoms in the caverns to the north (beneath modern-day Tethyr and Amn). Each son claimed one of the children of Moradin as his patron deity and so each of the subkingdoms they established became tightly linked with the church of that particular god or goddess. Around -9000 DR, skirmishing broke out between the eight northern kingdoms, as each fought to extend its borders at the expense of its neighbors. Over time, the skirmishes evolved into open warfare, pitting thousands of dwarves against one another. While these wars raged, the drow of Guallidurth took advantage of the dwarves' distraction to attack the caverns of Alatorin, which were far removed from the frontlines of the fighting. The First Spider War was fought from -8170 DR to -8150 DR and ended with the capture of Brightaxe Hall and the collapse of Alatorin. Aghast at their folly, the eight reigning kings of that era forged an armistice, and turned their armies against the drow. The Second Spider War raged from -8145 DR to -8137 DR, and ended with the drow retreating from the caverns of Alatorin. In triumph, the eight kings marched their armies back into Brightaxe Hall, pledging never again to fight on another. Seeking to reclaim the vision of Taark Shanat, the eight kings pleaded with their gods to pick one of them to sit on the Wyrmskull Throne. In response, the gods revealed the visage of the reigning king of Ultoksamrin, high priest of Dumathoin. Shield dwarves mark this event as the beginning of the Second Age of Shanatar and the elevation of Dumathoin as patron of their race. Mindstalker Wars to the dwarves and the War of Cloven Thoughts to the mind flayers. The illithids were driven back by -8080 DR, but in their wake the surviving Stout Folk discovered that the caverns of Barakuir, which had been cut off in the early days of the fighting, lay empty, Clan Duergar had been carried back to the thralldom in the mind flayer's realm. The Second Age of Shanatar lasted for nearly 1,800 years. Around -6150 DR, the drow of Guallidruth once again attacked the caverns of Alatorin. The Third Spider War lasted nearly thirty years but ended with the Stout Folk abandoning Brightaxe Hall to the drow. The dwarven refugees brought the Wyrmskull Throne with them, marking the end of the Second Age of Shanatar. As the Third Age of Shanatar dawned, the emperor of Shanatar made plans to establish a new subkingdom in the Realms Above. Dwarven scouts were sent up to the surface around -6100 DR, where they allied with humans of the region to oust the remaining djinni despots. The alliance between the dwarves and the humans quickly foundered because the rulers in Coramshan turned to evil gods. In response, the dwarves claimed the surface lands north of the Marching Mountains as their won, establishing the kingdom of High Shanatar around -5960 DR.
High Shanatar flourished for centuries under the rule of House Axemarch, but the seeds of its destruction were planted within a century of its establishment. A conflict over a looted tomb led to skirmishing and eventually open warfare. The First Kingdom of Mir was established after Iltaker fell to Murabir Mir of Coramshan in -5330 DR, marking the beginning of the centuries-long expansion of Calimshan at the expense of High Shanatar. By -2600 DR, the last known dwarves of High Shanatar had fallen on the northern banks of the Sulduskoon River, and High Shanatar was no more. As High Shanatar struggled to hold on to its territories in southwestern Faerun, Deep Shanatar struggled with challenges of its own. Successive waves of emigration led many young dwarves north to found new realms but also depleted the ranks of those who remained. Over time, the northern kingdoms of Drakkolor, Korolnor, Sondarr, Torglor, and Xothaerin slowly dwindled away as their inhabitants migrated north. The kingdom of Oghrann was established beneath the Plains of Tun in -5125 DR. The coastal realm of Haunghdannar was established in the northern Sword Mountains and along the northern Sword Coast in -4974 DR. Ammarindar was founded beneath the Graypeak Mountains around -4160 DR, and Delzoun, the Northkingdom, rose beneath what is now the Silver Marches around -3900 DR. Unfortunately for the shield dwarves, their conquests in the North proved illusory, and the glory of Shanatar was never reborn. Oghrann fell in -3770 DR, and Haunghdannar in -3389 DR. Delzoun and Ammarindar lasted many more centuries, but the Northkingdom eventually succumbed in -100 DR, and Ammarindar was overrun in 882 DR by lingering horrors unleashed by the Netherese of Ascalhorn. In the South, after centuries of decline, the final fall of Deep Shanatar was precipitated by the Stout Folk themselves. Impelled by centuries of bitter resentment, Clan Duergar invaded Ultoksamrin and Holorarar around -1800 DR in a series of conflicts know as the Kin Clashes. Only Iltkazar survived the gray dwarf invasion, leaving Shanatar fallen in all but name. Despite their centuries-long decline and deserved reputation for dourness and cynicism, shield dwarves have never succumbed to fatalism. Shield dwarves had traditionally been divided into two camps â€“ the Hidden and the Wanderers â€“ although such divisions have begun to fade since the Thunder Blessing. While members of the former group have literally hidden themselves away from the outside world, content to pursue their traditional way of life, members of the latter group have gone out into the world, unbowed by their face's relentless decline. Shield dwarves are traditionally slow to trust and slow to forget slights, but a dawning realization of their race's plight has left many willing to seek out new ways of doing things unconstrained by traditional prejudices or practices. Shield dwarves have a long and proud tradition of adventuring, and many shield dwarves follow this route simply in hope of equaling or exceeding the deeds of those who have come before. Others seek to recover long-lost strongholds and treasures that have fallen to orcs or others beasts. Since the Thunder Blessing, the question for many young shield dwarves is not why they should become adventurers, but why they should not. Constant warfare with orcs, goblins, trolls, and giants have imbued a strong martial tradition in shield dwarf culture. Most dwarves learn to defend their homes and clan, with fighters, paladins, and martial clerics being commonplace. Other shield dwarves focus on time-honored skills, following the path of the expert or rogue. Arcane spellcaster are quite rare, with few of sorcerous inclination. Common multiclass combinations include fighter/cleric, fighter/paladin, and fighter/expert. Favored Class: A shield dwarf's favored class is fighter. For centuries shield dwarves have fought a war of genocidal destruction against orcs, goblins, trolls, and giants of the North. Fighters have always served at the core of shield dwarf armies, even defiant in the face of overwhelming odds. Prestige Classes: Battleragers are legendary dwarven warriors who can enter a divine battle frenzy through ritualistic singing. Given to drinking, rowdy and boisterous singing, and drunken dancing, battleragers love to plunge into close quarters battle, heedless of any danger. Shield dwarves of some accomplishment frequently adopt the dwarven defender prestige class, and many of their clerics become runecasters. Although clan and class divisions were once strong among shield dwarves, generations of decline have largely broken their once dominant influence. While shield dwarves are still incredibly proud of their bloodlines, individual accomplishments now count for more than longstanding tradition of the dictates of class elders. Shield dwarves life among the Hidden is still dominated by craft and forge, but increasing numbers of shield dwarves are making their own way in the world as adventurers or as craftsfolk dwelling in human-dominated communities. displays of wealth, they avoid ostentatious or decadent behavior. As shield dwarves age, they are honored for their wisdom and accorded respect for their past accomplishments. Families and clans are expected to honor their elders in death with solemn funeral rites and tombs befitting the deceased's reputation and accomplishments. Generations of Wanderers have created large and thriving dwarven enclaves within most human settlements, with all shield dwarves welcome as posrt of the loosely knit dwarven â€œclan". Shield dwarves occupy the roles of smith or craftsmen in many human communities and are well respected for their skill as artisans. Few shield dwarves turn away from the venerations of the Morndinsamman, but most are quick to learn the local trade tongue and make friends with other races. Like all dwarves, shield dwarves speak Dwarven and employ the Dethek rune alphabet. They also speak Common. The primary shield dwarven dialect, Shanatan, dates back to the founding of Shanatar and is still spoken by dwarves along the Sword Coast from the Shinning Sea to the Spine of the World. To the east, in northcentral Faerun, most shield dwarves speak the Galenan dialect, strongly influenced by the Damaran human tongue. Common secondary languages reflect the extensive trading contacts maintained by shield dwarves with their neighbors in the North and include Chondathan, Illuskan, and, to a lesser extent, Elven and Gnome. The shield dwarves of northcentral Faerun are more apt to learn Damaran than Illuskan as a secondary language. Many shield dwarves also learn the languages of their traditional foes, including Draconic, Giant, Goblin, and Orc. Shield dwarves have been engaged in a perpetual war against goblinoids and giants for centuries, so their magic reflects a martial bent. Anything that helps slay more giants is a welcome addition to the shield dwarf arsenal. Among the Hidden, magic from the Illusion and Abjuration schools are immensely important, because they guard a dwarf clan from discovery and attack. The Hidden create layer after layer of protective spells to guard entrance to their strongholds. Many an invading orc horde has been tricked into leaving or frustrated into exhaustion without even seeing the shield dwarves they're fighting. Spells and Spellcasting Shield dwarves have a strong diving spellcasting tradition, with many of the Stout Folk called to serve the Morndinsamman as clerics, paladins, runecaster, or runesmiths. Arcane spellcaster are much more rare, but increasing in number. Spellcasting Tradition: Shield dwarves often take the Shield Dwarf feat, which reflects their knack for creating armor and shields with magic. Unique Spells: Shield dwarves have created many divine spells over the years, including mindless rage and shape metal. Racial Magic Items Shield dwarves favor magic items that aid in combat, whether offensively or defensively. Whether magic is best employed to protect of attack is a centuries-old argument among the shield dwarves. With Wanderers favoring magic weapons and the Hidden favoring magic armor. In any case, all shield dwarves revere any magic item that facilitates craftwork, because the urge to create flow strongly in dwarven blood. Axes and other blades are commonly crafted with keen, holy, lawful, flaming, flaming burst, mighty cleaving, sundering, and stunning special abilities. Hammers and maces are commonly crafted with holy, impact, lawful, returning, shock, shocking burst, stunning, sundering, and throwing special abilities. Armor is typically crafted with fire resistance, fortification, and invulnerability special abilities, reflecting a long tradition of battles against orcs, goblinoids, trolls, and giants, and a deep understanding of metalworking. Common Magic Items: Common examples of items favored by shield dwarves include anvils of the blacksmith, style="FONT-STYLE: italic">belts of dwarvenkind (often given as gifts to nondwarves who help a dwarf clan), style="FONT-STYLE: italic">boots of the winterlands, forges of smithing, banners of the weaponsmith, tongs of the armorer, and whetstones of keen edge. Iconic Magic Items: Shield dwarves have fabricated many unique magic items as well, such as italic">doorbreakers[i], hammers of staggering blows, and stonereavers. They are justly famous for foesplitter axes, which are +1 keen battleaxes. Shield dwarves have venerated the dwarven deities of the Morndinsamman since the dawn of Shanatar, although their mythology has evolved significantly over the millennia. Taark Shanat and his followers in Alatorin venerated Moradin and Berronar, but worship of those deities receded as Taark's eight sons set out to found their own kingdoms, each choosing a patron deity of his won from among the eight children: Dumathoin, Laduguer, Abbathor, Clangeddin Silverbeard, Vergadain, Sharindlar, and the twins Diinkarazan and Diirinka. When the eight kings came together to choose who would first sit on the Wyrmskull Throne, Moradin selected the king of Ultoksamrin, who was also the high priest of Dumathoin. This act cemented the Silent Keeper's position as patron deity of the shield dwarves but strongly disappointed Dumathoin's chief rivals, eventually leading to Laduguer's bitter exile and Abbathor's enduring corruption. By the fall of Shanatar, the shield dwarves had abandoned the worship of Laduguer, Diinkarazan, and Diirinka, while younger gods such as Thard Harr, Gorm Gulthyn, Marthammor Duin, Dugmaren Brightmantle, and Haela Brightaxe had arisen. Dumathoin is considered the patron of shield dwarves, and his church has by far the most adherents among shield dwarves. Miners and smiths venerate the Silent Keeper, but he also has a small following among those good and neutral-aligned shield dwarves seeking secrets of arcane lore. The Mountain Shield is also considered the guardian of the dead and is propitiated by most shield dwarves during burials. Dumathoin's clerics take charge of all burials, inter the dead in secret vaults, and guard the funeral wealth of great shield dwarves. Shield dwarves get along with most other dwarven subraces, although they regard gold dwarves arrogance as naive and have little understanding for their barbaric wild and arctic dwarven kin. Shield dwarves have a longstanding enmity for the descendants of Clan Duergar, dating back to the Kin Clashes that marked Shanatar's final chapter, and they attack duergar on sight. Despite centuries of squabbling with elves and half-elves, shield dwarves have always managed to put aside their differences with the Tel-quessir in the face of outside threats. Shield dwarves have always gotten along well with gnomes, particularly rock gnomes and deep gnomes. Colored by their experience with lightfoots, shield dwarves find halflings to be somewhat unreliable buy easy to get along with. Shield dwarves get along well with most humans, particularly Illuskans, Tethyrians, Chondathans, and Damarans. Shield dwarves see half-orcs as little better than their hated brethren, although exceptions do exist. The Stout Folk of the North associate most planetouched with the horrors of Hellgate Keep and view them with suspicion. 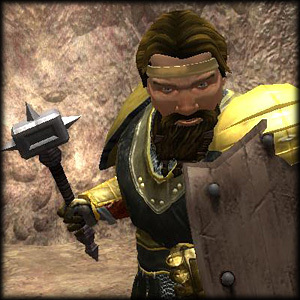 Earth gensai are a notable exception and are commonly welcomed in dwarven delves across the North. Shield dwarves commonly employ equipment such as armor lubricant, mobile braces, rope climbers, thunderstones, and sunrods. Arms and Armorer Shield dwarves favor a wide range of weapons, including battleaxes, crossbows, gauntlets, handaxes, heavy picks, light hammers, light picks, longswords, half spear, short swords, mauls, throwing axes, and warhammers. More unusual weapons include dwarven urgroshes, dwarven waraxes, horned helmets, spiked chains, spiked gauntlets, spiked helmets, and spike shooters. Typical forms of armor include breastplates, chainmail, half-plate, full plate, large steel shields, and small steel shields. Less common forms of armor include dwarven plate, grasping shields, and large mithral shields. Whenever possible, shield dwarves fashion their armor from mithral; their love of the metal matches the gold dwarves' admiration for adamantine. Shield dwarves favor bats (especially the common bat), canaries, and small lizards such as the spitting crawler as pets and familiars. They use pack lizards and mules as beasts of burden. Shield dwarves commonly employ ponies or war ponies as steeds, except in Iltkazar, where riding lizards are still the norm. Favored breeds include the Island pony, the Nether pony, and the Whiteshield (war pony). The shield dwarves of the Far Hills employ dire bats as steeds (fitted with exotic military saddles) to navigate the subterranean wells they call home. Shield dwarf barbarians and battleragers often employ boars as steeds.